Documentary filmmaker Duc Nguyen of Fountain Valley, shown Thursday at the Vietnamese Boat People Monument in Westminster Memorial Park, was so touched by reports of Syrian refugees dying at sea that he began a campaign to bring attention to the issue. It is just a belt buckle in a Vietnamese refugee exhibit. A sailor on the U.S.S. Long Beach gave it to Duc Nguyen in 1980. The buckle serves as a reminder of the help Nguyen needed as a boat person; the help he got; and the help he’s offering a new generation of boat people – refugees from Syria, Libya and Eritrea crossing the Mediterranean Sea. Nguyen, a documentary filmmaker, recently launched a social-media campaign called #ICareBecause, calling attention to the Syrian crisis and urging support. At first, Nguyen sought to raise money to help. But after a few calls, he knew he had to change tack. First he had to change minds. Nearly a half-million Syrian refugees have pushed into Europe so far this year. The Balkans are overwhelmed. Hungary has shut most of its borders. Croatia, Slovenia and the Czech Republic are shutting borders too. But this crisis is not new. Since the Syrian civil war started in 2011, an estimated 2.5 million have fled the country. Soon after, American entrepreneur Christopher Catrambone made it his business. He bought a 131-foot trawler, staffed it, and stocked it with hi-tech gear to find and rescue refugees at sea. He called his foundation the Migrant Offshore Aid Station (MOAS). It was a story on Catrambone’s work that caught the eye of filmmaker Nguyen, who offered to raise money to help. For one thing, Nguyen was a boat person himself, rescued by the U.S. Navy in 1980. For another, his award-winning documentary, “Bolinao 52″ was about another group of boat people – specifically a boat that left Vietnam with 110 refugees and arrived in Bolinao, Philippines, with just 52 alive. “I felt so compelled with this mission,” Nguyen says. He started making calls in recent days. One was to a former U.S. Navy commander who’d rescued Vietnamese boat people in the years following the 1975 fall of Saigon. The man refused, saying these immigrants did not share the same values as Europeans and were creating problems. Nguyen knew that without support, refugees had no hope. So he shifted his focus from raising money to raising support for them — initially among people who could relate: Vietnamese Americans here in Orange County’s Little Saigon. “People are dying at sea and the only thing you can do is try to rescue them,” he says. “I care because all life is special,” Garden Grove City Councilman Chris Phan says in one video. “I care because I have many friends, they were boat people; some of them died at sea,” actress Kieu Chinh, from the film “The Joy Luck Club,” says in another. 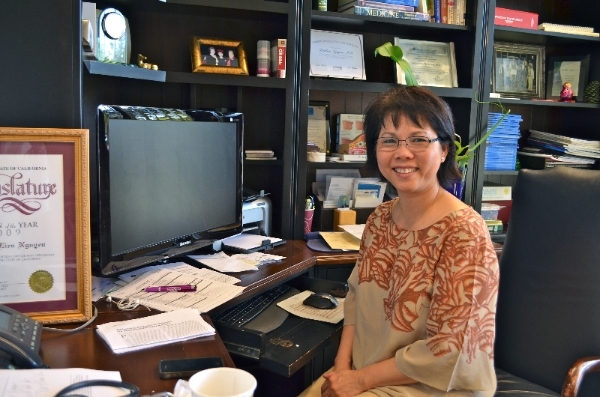 “I care because no one deserves to die at sea,” human rights lawyer Hoi Trinh says in another. Garden Grove Mayor Bao Nguyen also appears in a video. In a telephone interview, he explains how his mother nearly died in a refugee boat approaching Thailand. So many boat people already had arrived that armed men lined the shore, forbidding others from landing. But then Buddhist monks arrived and formed a human chain, leading the refugees ashore, protecting them and bringing them to a United Nations refugee camp. That’s where Bao Nguyen was born. Three months later, his family arrived in America, broke. Now he’s mayor of a city of 170,000. Duc Nguyen’s belt buckle is part of an exhibit called “Vietnamese Focus: Generations of Stories,” at the Old Orange County Courthouse in Santa Ana that is reminding many viewers of a modern exodus. That’s what high school teacher Ky-Phong Tran has been doing in his own way. Tran is the kind of person who raised $3,000 for the American Heart Association in 2010 in honor of his mother. 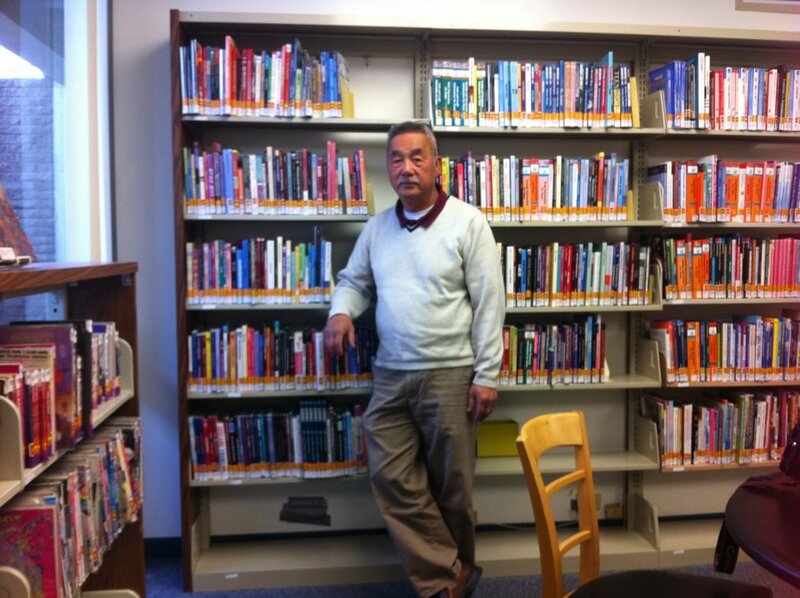 He collected 2,000 books in 2012 for a school with no library. And he raised $4,000 in 2014 for a student who was injured in a bus accident. He helps people. So when he saw photos of the drowned Syrian refugee boy earlier this month, he re-arranged plans for his Sept. 6 birthday. “I have a cool job. I make good money. My wife and kids are safe. We don’t need anything so let’s do something to get everyone involved,” he says. He asked Facebook friends to donate to International Rescue Committee, and collected more than $2,700 in a few days – including $50 from his student Jazmin Dawkins, a 10th grader at Renaissance High School for the Arts in Long Beach. Tran also wrote to President Barack Obama asking for U.S. intervention. Just this week, the United States — which had admitted fewer than 1,600 Syrian refugees since their civil war began in 2011 — agreed to accept up to 10,000 Syrian refugees in the coming year. That’s a start, say those who want to do more, like Duc Nguyen. He still treasures the belt buckle a U.S. sailor gave him as a memento when the U.S.S. Long Beach rescued Nguyen’s small river boat overloaded with 107 people. Nguyen knows many Americans oppose helping Syrian refugees. But he hopes his ‘#ICareBecause” campaign will change minds, and spur people to help MOAS in its efforts to rescue boat people in the Mediterranean.